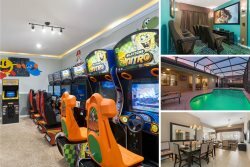 Select Vacation Villas is a family owned and operated property management company that was established to bring a higher standard of property management to Windsor Hills Resort vacation homes. After spending many years as vacationers to the Central Florida area, we discovered that above all, Guests are looking for location, quality and service. Select Vacation Villas is a small company who truly cares about their Guests and their Owners by providing them wth a bespoke personalized service. Andrew purchased a home in Kissimmee, Florida which was managed by a local management company. Andrew's vision was to take the positives from his own experience of owning a rental property, eliminate the negatives and offer Guests an exclusive service. Andrew's background in the UK in Customer Service stems from his early days a Chef to running his own Chauffeur Company. Keeping the client happy has always been paramount and living within 1 mile of Windsor Hills Resort and all the other nearby communities in the Four corners area guests on vacation will not only benefit from the vast array of customer service, but you the homeowner will see an increase in rentals due to guests looking for homes managed by Select Vacation Villas.